I left Kyoto, riding down the beautiful Kama river to start with. I was riding from one former Japanese capital to another: Nara, though it was 1200 years since the city had held this position. The ride between the two cities was pretty uninspiring as it was mainly on narrow busy urban roads. 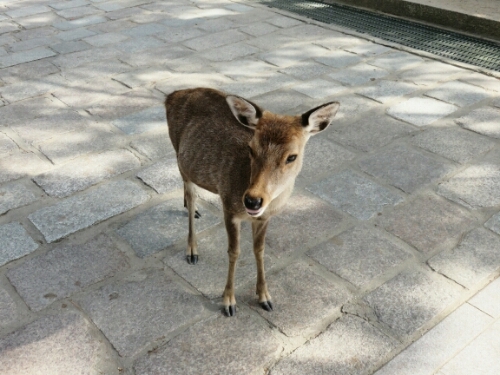 Nara itself was thankfully very pleasant. As I’d been there before I was only planning on a flying visit before heading to my real destination of Koyasan, of which there will be more later. 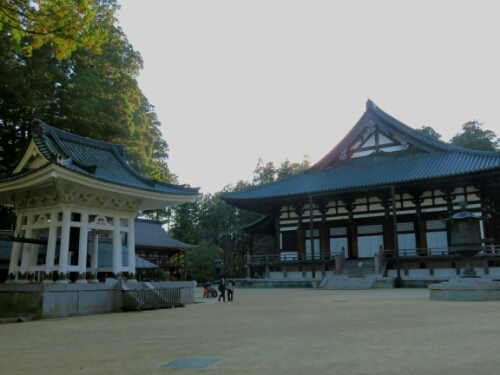 Nara, like Kyoto, packs many world heritage sights into a small space, indeed most of the main sights are in Nara park and so I rode straight there. As I didn’t want to hang around I popped into a Japanese garden as it was free for foreigners and then went straight to Todai – ji one of the more impressive temples in the world. 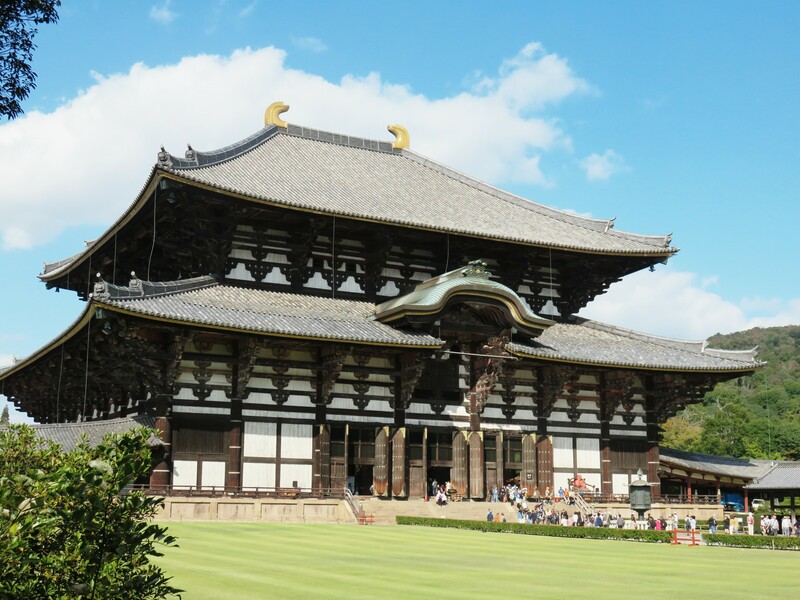 It’s main hall is huge and was, according to Wikipedia, the largest wooden building in the world until recently. 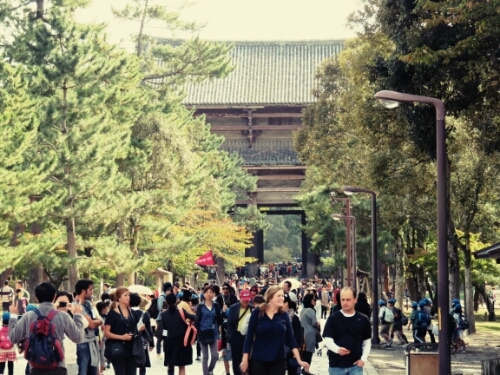 Nara was pretty busy as I’d arrived at the weekend and there were tour groups everywhere. Though from what I saw they were only dangerous to any food that came near them. After seeing what I wanted to see in Nara I headed off onto some more busy roads to try and get as close to Koyasan as possible that day. This meant that I ended up camping where I’d reached when it got dark. This turned out to be next to a railway line and between two highway over passes. I surprised myself by sleeping well. 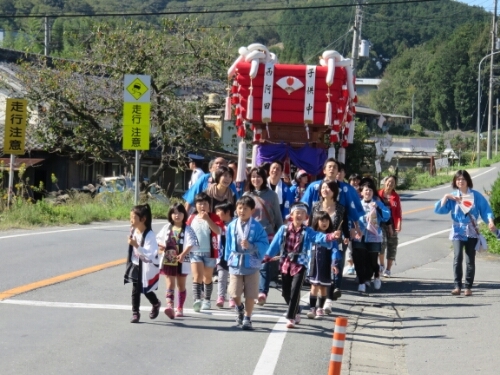 The reason I was heading to Koyasan was because many consider that to finish the Shikoku pilgrimage you must visit here. 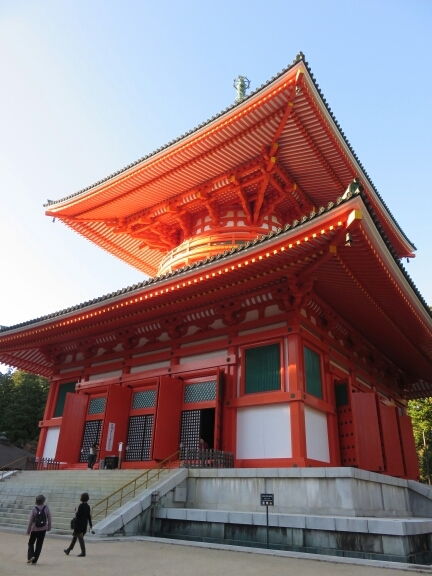 This is because they believe that Kobai Daishi, the founder of the pilgrimage, resides on Koyasan in eternal meditation. For my part I’d heard it was a lovely place and I thought I may as well finish the pilgrimage properly. 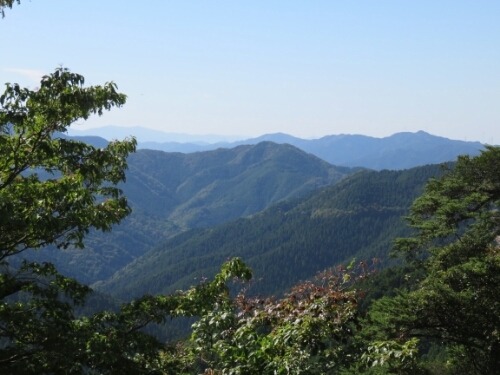 In Japanese san can mean mountain, so Koyasan means Koya mountain, which meant I had some climbing to do. Thankfully it never got too steep and the road was quiet and very lovely and I was soon up at over 800m. At the top, which isn’t really the top of a mountain as Koyasan is set between eight peaks that are supposed to be like a lotus flower, there is a small town made up predominantly of temples. There are 120 temples according to Wikipedia and I wasn’t planning on visiting 2% of them. I was only planning on seeing three of the main attractions while I was up there. The first sight I went to was Okuin which is the largest cemetery in Japan. It’s an incredible place and really is huge. 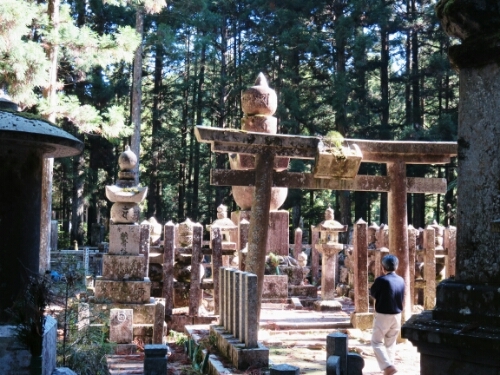 There are a staggering number of shrines and grave markers there all set amongst towering trees. After Okuin, I headed to Kongobuji, the head temple of the Shingon sect of Buddhism which is the one related to the pilgrimage, I think. 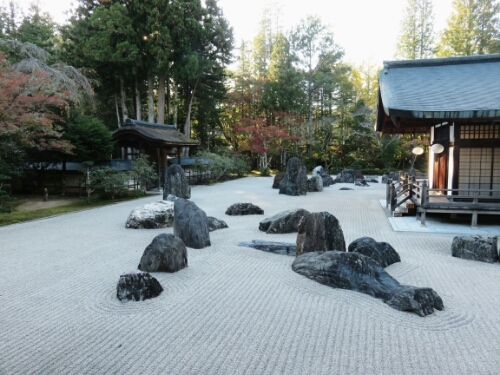 This had some beautiful screen doors and the largest rock garden in Japan. The rock garden was supposed to represent a couple of dragons or some such. Finally I pottered round to Danjoguran which is basically a really huge temple. Everything there was on a grand scale and it made a lot of the small temples I’d seen on Shikoku seem very tiny. After seeing everything I wanted to see I rode back down the mountain. As twilight was approaching I rode down as fast as possible overtaking a lot of cars on the tight bends, I’d seen a possible camping spot earlier and as I was retracing my steps as I went down I was returning there. By the time I’d bought dinner and gotten back to the spot it was pitch black and I had to put my tent up in the dark. Luckily I’d been camping so much recently that it wasn’t too much trouble and when I woke in the morning I didn’t have any nasty surprises. While looking through the lonely planet on Koyasan I’d noticed that I wasn’t too far from Ise, the site of one of Japan’s most sacred shrines so I decided to head there. I had a few days before I flew to Canada that I needed to fill. It turned out that the way there could perhaps be described as the scenic route. In other words it was very beautiful but tough on the bicycle with a lot of hills. There were also packs of motorcyclists riding the route in both directions. I’ve never seen so many Harley Davidson’s! I also rode through one of Japan’s tea growing regions. 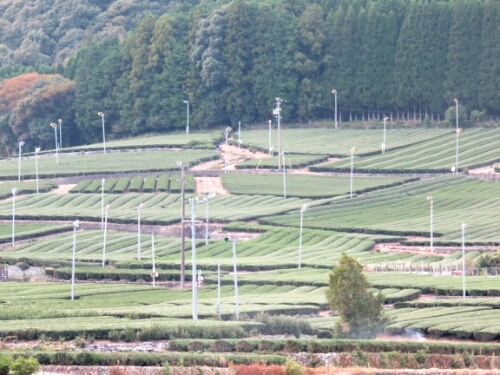 I never really thought about Japan growing tea, only drinking it so it was quite interesting to see. That night I wouldn’t quite make it to Ise and so after being refused camping at a road side service station I found some grass by a river. It was damp but quiet. The next morning I woke to rain, my tent was pretty wet and I had to hope the weather would clear up so I could dry it out. I got to Ise fairly quickly and found its shrine, it was definitely one of the more interesting places I’ve seen in Japan, if a little disappointing. I was expecting an impressive architectural experience and in many ways didn’t get this. 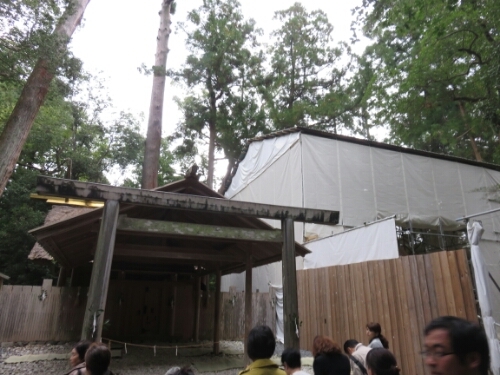 Ise shrine is a more spiritual place, it being Japan’s holiest Shinto shrine dating from the 3rd century. This became clear with the way tourists acted there. Firstly I was pretty much the only foreigner. I don’t know if it was because I was early but I didn’t see any other foreigners actually in the shrines. Compared to the temples at Kyoto or Nara this was very different. 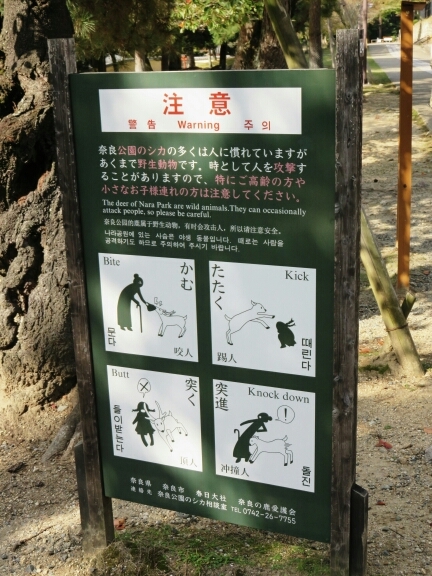 The Japanese tourists were also much more restrained and any tour guides didn’t seem to be constantly explaining everything very loudly. As well as tourists there also seemed to be a lot of people who had come specifically for religious reasons. Many people were dressed carefully in suits and there was a much greater sense of respect than I’d felt at Buddhist temples. There are two main but similar parts to the shrine and the entire area of the shrine in totality allegedly covers an area the size of the city of Paris. 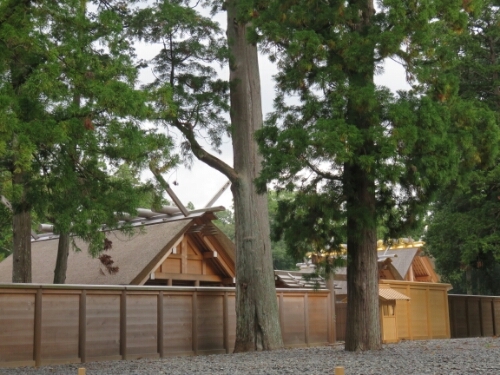 What I found interesting is the fact that every twenty years the buildings of the shrine are replaced. 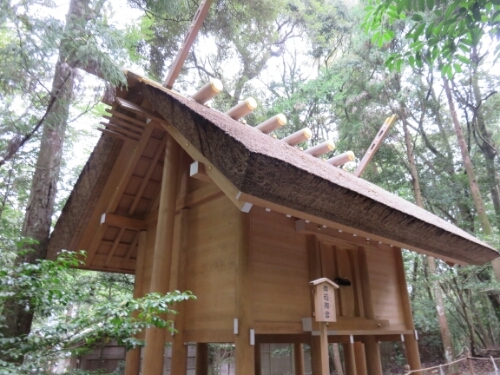 The replacements are built on sites right next to the previous shrines and are put together using the same techniques as in the past in exactly the same way. The main shrines had only been rebuilt in 2013 so it was strange to see what are considered to be such ancient buildings looking so new. They are also very austere with very little decoration making the place seem very solemn. What was perhaps most disappointing is that ordinary mortals are not actually permitted into the inner sanctums of the main shrines and the most important buildings are obscured behind fences. 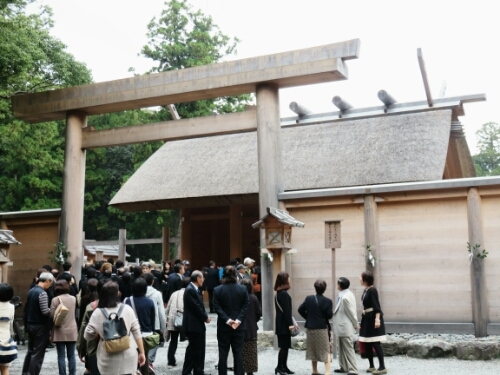 Only members of the imperial family and some priests are actually allowed inside. You can with some effort see the temples from the outer areas you are allowed into but no photos are allowed from here. All in all it was a very strange and I felt very much out of place there which is I suppose how it should be half the world away. Upon leaving the shrine it started to drizzle and carried on doing so off and on for much of the day. That is until the afternoon when it really got down to business and decided to become a torrential downpour for a while. I sheltered from much of this but not without getting pretty wet in the few minutes it took to find somewhere dry. Luckily I had managed to get most of the water off my tent earlier when I’d stopped at a supermarket so I wouldn’t be getting into a sopping wet tent that night. I was now heading towards Takayama close to the Japan Alps. 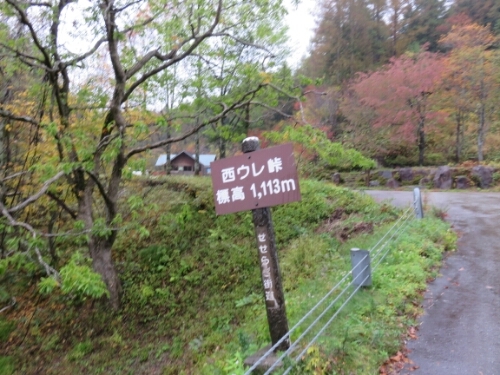 It was close to the highest road in Japan which I wanted to try and ride. In the end that day I camped under some trees on the grounds of a small shrine as darkness was falling. The rain kept up through the night and while no extra water got in my tent all my bags were damp when I brought them in and were still damp when I woke up. Everything in fact was fairly damp. So the day started off as the previous one had ended, fairly miserably! The riding to start with was also fairly grim as it was still on busy main roads as it had been since Ise. On the plus as I was riding close to the coast it was at least, unusually for Japan, flat. I was heading now in the direction of Nagoya, Japan’s industrial heartland and this was clear from the factories I could see. 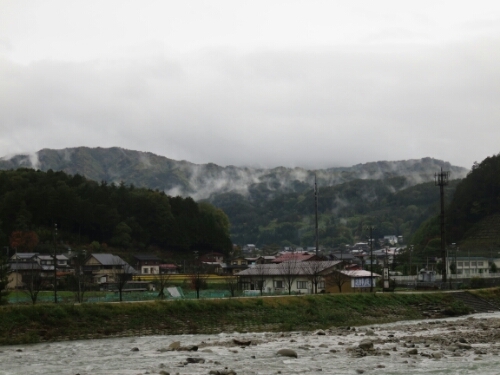 I wasn’t planning on heading into the city but over and around it and eventually I came off the main route and onto quieter roads by the Kiso river. The first of these roads ran down a thin piece of land in the middle of the river itself, a landform a geographer would probably know the name of. The day was brightening up as well so I did too. Eventually the sun even came out a bit and I hurriedly stopped and put my tent up to dry. I got my sleeping bag out and clothes to air as well in case it didn’t last long. After about half an hour a security guard for the park I was airing my stuff next to told me it was forbidden to camp there. My explanation that I wasn’t camping and was just drying my stiff fell on deaf ears. So I very very slowly packed my stuff away so that I left at a similar time I would have anyway with my things all nice and dry. 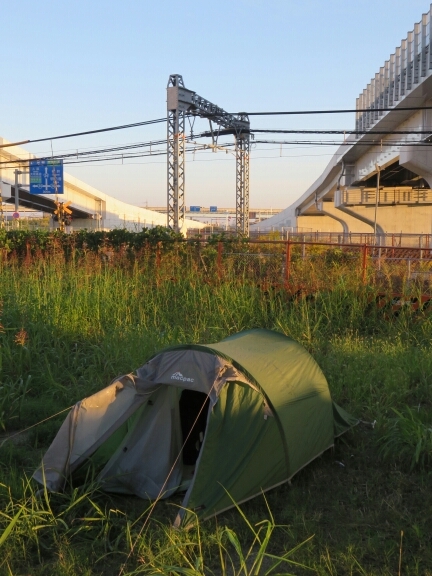 Still I had now learnt that you can’t actually camp anywhere in Japan as I had started to think! The Japanese shinkansen, or bullet train. Hard to photograph as it's so very fast! 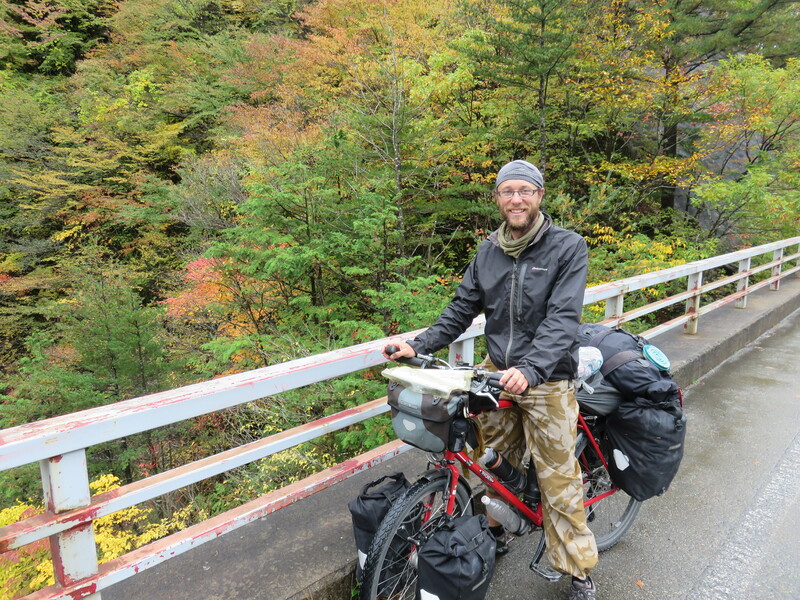 Carrying on I made it up to the very start of the mountains and camped at a michi no eki, a Japanese road station. I found a spot out the back and having put my tent up used the service station’s electricity and WiFi… luxury. In case anyone was wondering, this was now my fifth day camping and I was looking forward to getting to Takayama where I’d arranged to stay with a couch surfing host the next evening. In the morning it became apparent I wasn’t going to have an easy day of it. The drizzle was back for one thing and while the mists were pretty the rain was not. It was a very cold and wet ride. It was made even worse in that close to the pass the rain started to fall hard and continued to do so as I began to descend. This made me even colder and wetter, I hadn’t felt this miserable on the bike in months! 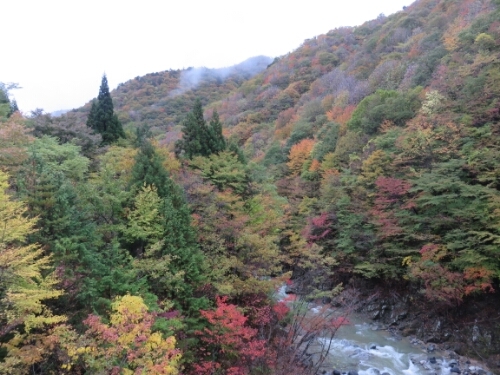 Still on the way up when it has stopped raining briefly I’d been able to appreciate Japan’s beautiful autumn colours. Down out of the mountains they hadn’t started to come in yet but up higher where it’s cooler autumn had come early and some of the amazing reds and yellows were already showing. Sadly at the top it was raining too hard to get photos of the really beautiful bits but I did at least get to see them. While the descent to Takayama was cold it was at least quick and I got there on schedule. Great blog 🙂 Is Japan generally expensive and we were wondering whether it was possible to avoid busy roads? Hey, thanks! I would say Japan is generally quite expensive but it doesn’t have to be wildly so. Wild camping is very easy and safe here, I’ve always been able to find somewhere. Couch surfing and warmshowers.org is also an option. It’s possible to eat well at a reasonable price too. It’s also very comfortable riding here, there are convenience stores with clean bathrooms almost everywhere and good supermarkets. You can get by on about $20 per person if you don’t stay in hotels. Depending on your route it’s definitely possible to avoid busy roads if you don’t mind a few hills/mountains. Generally these are the most beautiful anyway. If you have any more questions don’t hesitate.